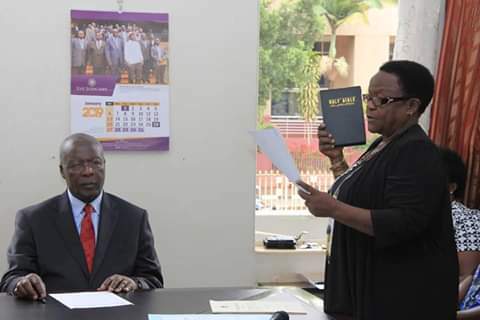 KAMPALA – The Chief Justice, Bart M. Katureebe, earlier today presided over the swearing-in ceremony of Ms Winnie Agnes Kabogoza-Musoke as a new member of the Public Service Commission (PSC). Ms Kabogoza got a new lease of life at the Commission after being re-appointed by President Yoweri Museveni last year following the expiry of her term in office. In his remarks, the Chief Justice emphasized that the appointing authority put more focus on the candidate’s integrity so as to aid in the thriving of the public service. He added, “public service was at one time second to none in East Africa and now it is your duty to make it recover by ensuring that the people you put in have more than academic qualifications,” the Chief Justice said. The Chief Justice also urged PSC to defend public servants who are maliciously accused. The PSC, among other functions, reviews the terms and conditions of service, standing orders, training and qualifications of public officers. Ms Catherine Bitarakwate, the Permanent Secretary of the Ministry of Public Service asked the Chief Justice to continue supporting the Ministry. The PSC Chairperson, Justice Ralph Ochan commended the Chief Justice for his leadership in the Judiciary.